COCOA BEACH, Florida -- The City of Cocoa Beach and Brevard County officials are bracing for a special event which both the County and City say was not authorized to take place at Lori Wilson Park in Cocoa Beach, Florida this Fourth of July weekend. 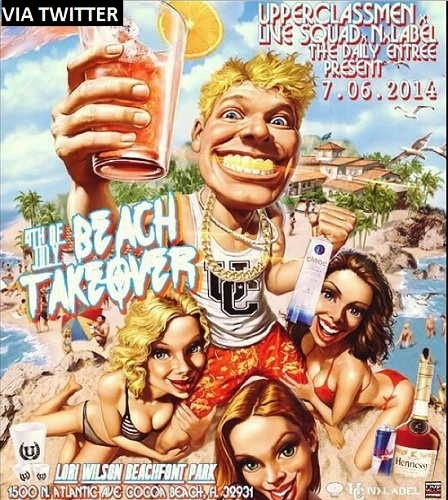 The event, titled "4th of July Beach Takeover," is scheduled to take place on Sunday, July 6, according to a flyer that is being circulated on social media. According to the flyer, an appearance by the musical group Upper Classmen will be accompanied by service of liquor in glass bottles. Although Lori Wilson Park is in Cocoa Beach, it is owned and operated by Brevard County. "This event was not reviewed nor approved by the City special events committee," said Cocoa Beach City Manager Rob Majka. According to County officials, the County does not have any events, and has not permitted any events, for Lori Wilson Park this 4th of July weekend. "In the event the organizers cannot be contacted by prior to Sunday to shut the event down, we will have resources in place to trespass the organizers, vendors, and entertainers from the park under an agreement already in place with the County," Majka said. Just last month, Cocoa Beach residents became upset over another event during a busy holiday weekend, San Juan Bautista 2014, that was organized by Orlando radio station Rumba 100.3 FM. Following residents' complaints over the San Juan Bautista event, the City of Cocoa Beach is in the process of erecting TOW AWAY ZONE signs on residential streets around Lori Wilson Park.